Jean de Sainte-Colombe: Concert #41 "Le retour"
Although this is only a compilation of previous issues, this CD is as sumptuous as the display it attempts to convey. The settings are the magical Versailles gardens where every year, from March to October, a famous and magical fountain festival is held to the awe of more than a million visitors. Devised by the 'Sun King', Louis XIV, this bewitching spectacle of water and music has survived almost intact and is still one of the major attractions, for all those who visit France, particularly Paris and its environs. This year, the musical programme has been assigned to Jordi Savall, who certainly needs no introduction for this category of very spectacular and royal sounds. Savall has selected some of the finest gems from the AliaVox catalogue, treasures such as 'Orchestra of the Sun King' (AV9807), 'The Orchestra of Louis XIII' (AV9824) and Couperin's 'Concerts Royaux' (AV9840) amongst others. 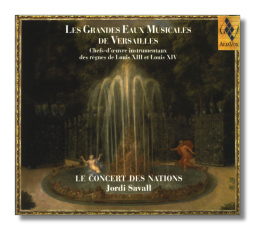 Together with 'Le Concert des Nations', Savall manages to etch a captivating fresco of music from the 'Grand Century', spanning the entire spectrum of pomp, pageantry and at times, fragile intimacy of this long gone but never forgotten French opulence. This unique selection, performed majestically by the specialists in the repertoire has a strong and arresting allure that not only transports the listener to an era of extreme social disparity, but also conjures up visions of utopic brilliance. The recordings are spacious, sonorous and wonderfully atmospheric, while Savall's annotations are, as usual, a goldmine of historic as well as musical details. A labour of love that took six years to complete, compressed into 78 minutes of dazzling beauty to be savoured for generations to come.